Sao Bento Station is one of Porto's major stations providing network trains for intercity and local transit. To get to the station from Porto airport you can either take a taxi, bus or the metro. By taxi is the quickest and most efficient transfer method. A Porto airport taxi should take around 25 minutes and cost around 25€. The metro and bus run from the airport also - the metro takes around 30-35 minutes and will cost 2.45€. The bus, in contrast, will take around 40 minutes and cost around 1.95€. Welcome Pickups offers meet and greet services and a friendly introduction to Porto at the same price as a regular taxi. Click here to see the cost. Hiring a Porto airport taxi to drive you to Sao Bento Station is the quickest and most comfortable method. Taxis will be stationed outside the airport, should display a meter and will be generally beige or black with a green roof. The taxi journey should be relatively straight from the airport and take around 20 minutes in normal traffic conditions. Taxis in Porto can be expensive. There is no set fare from the airport as all taxis operate on a meter. Therefore, the journey cost is approximately 25€, however there are different tariff prices that operate for nights (between 09:00pm and 06:00am), weekends and holidays which are approximately 20% more than standard fare. There is also an airport supplement cost of 2.50€. Taxis, although a pricier option to public transport, are modern and comfortable, operating 24/7 and providing a quick, stress free alternative to transfer to the station for your on-going journey. It is helpful to ensure you know the Portugese name for your destination as despite most drivers being competent English speakers, English versions of place names can cause confusion. Large luggage or excess luggage can incur a fee for the taxi of 1.80€ per bag. Most taxis in Porto are Mercedes brand. Ensure to clearly state that you wish to go to the station in Sao Bento, not the centre, as an area nearby shares the name! The Metro does not go on a direct route to the station, but will require a transfer of lines, which will then arrive at the station without any further walking. The Line E (purple) leaves from the airport, which you need to take until you arrive at Trinidade, then you will need to switch lines to the D Line (orange) to take you to Sao Bento Station. How much is the Metro from Porto Airport to Sao Bento Station? The metro pricing is based on zones within the city, therefore the cost is dependent on the amount of zones crossed. The journey should cost 2.45€ and you can purchase the tickets from the machines in the station or the tourist office counters in the arrivals hall. The tickets are on a rechargeable card. There may be up to a 30 minute wait for the Metro. The Metro operates between 08:30am - 08:00pm weekdays, departing every 20 minutes and between 06:00am - 00:30am on weekends, leaving every 30 minutes. The metro station is located underground. You will need to go into the lifts opposite the arrivals hall and go down to level -1 to access the metro station. Signage is plentiful in the arrivals area. 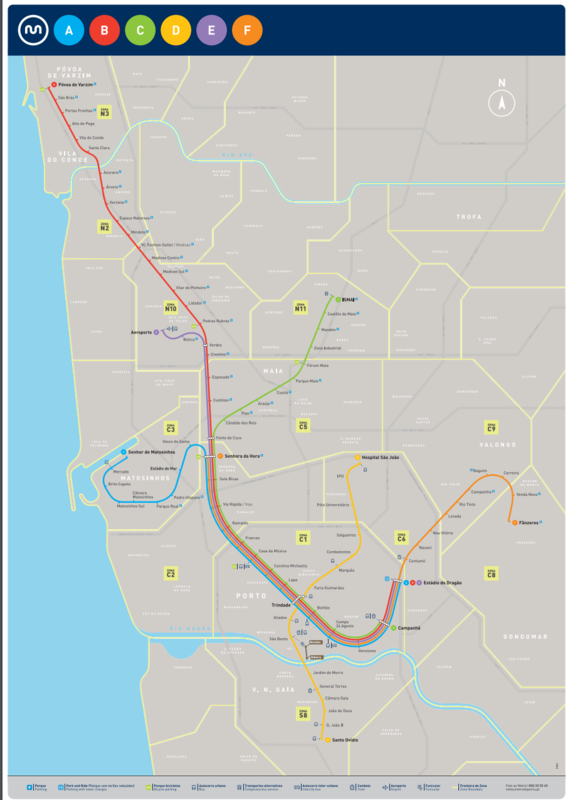 Although fast and well priced, the metro can be a hassle due to its limited operating times and indirect route which requires a switch of lines; adding extra time and bother to the journey. Remember to validate your ticket on the yellow machines before entering the metro. Not validating your ticket can incur a large fine of 95€. If you want greater flexibility with ticket options, go to the tourist ticket office counter, not the machines. The ticket machines are also available in English. Tickets have a travel time limit, make sure that you buy one that is long enough to cover your journey. Taking a bus to Sao Bento Station is not direct and will require a short walk from a nearby stop. The bus lines 601 and 602 leave from the airport at regular 25 minute intervals between 05:30am - 00:30am and the journey will take approximately 40 minutes to reach the station, including a 6 minute walk. Both lines will go to the stop Carnio, which you will need to alight at and walk to reach the station. How much is the bus from Porto Airport to Sao Bento Station? The bus fare is based on zones, therefore purchasing a ticket on the bus should only cost you 1.95€ for the single trip fare. If you wish to purchase a rechargeable card your journey should cost 2.40€, and this card is valid on any public transport in the city and is available from the ticket machines in the metro station near the arrivals hall. There may be up to a 25 minute wait for the bus. Bus lines run from the airport at 25 minute intervals between 05:30am - 00:30am, however holidays and weekends may mean longer wait times. The bus stations at the airport are clearly signposted outside of the arrivals hall. Due to the lack of a direct bus route, this method of transferring to the station can be cumbersome with luggage (as you will need to walk) as well as not a preferable option late at night. If you wish to take public transport, the metro is much more convenient. There are many bus lines that leave from the airport, operated by different local companies and taking different routes. Ensure you take the right line to get close to the station. Many independent bus companies run a shuttle-like service to Sao Bento from the airport. Ensure you leave yourself enough time for any delays to occur when travelling to the station. Always book tickets for Sao Bento trains in advance, it is much cheaper than purchasing on the day. How much is a taxi from Porto Airport to Sao Bento Station? A taxi fare from Porto Airport to Sao Bento Station on a normal metered fare should cost approximately 25€. Weekends, night-time between 09:00pm- 06:00am and holidays may affect this fare estimation. 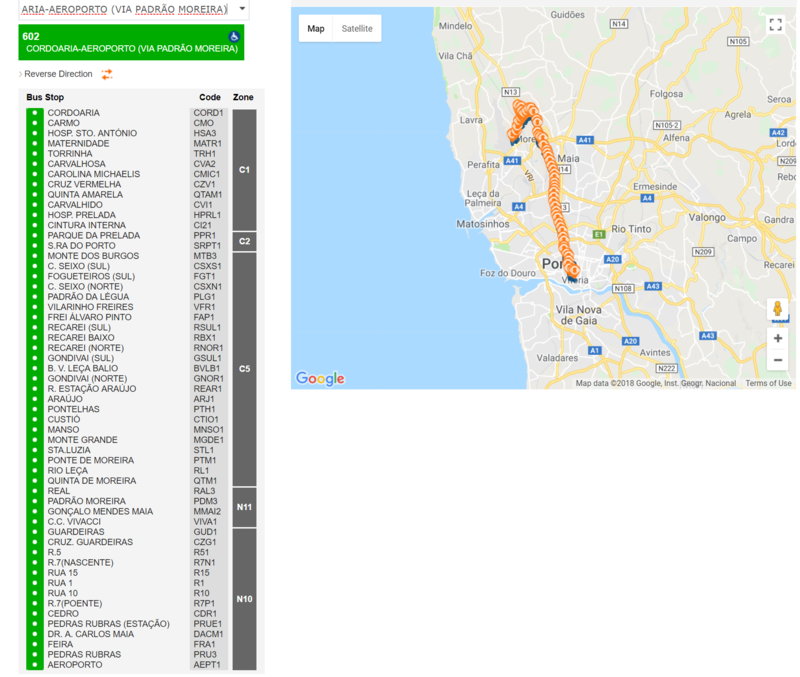 How far is Porto Airport from Sao Bento Station? 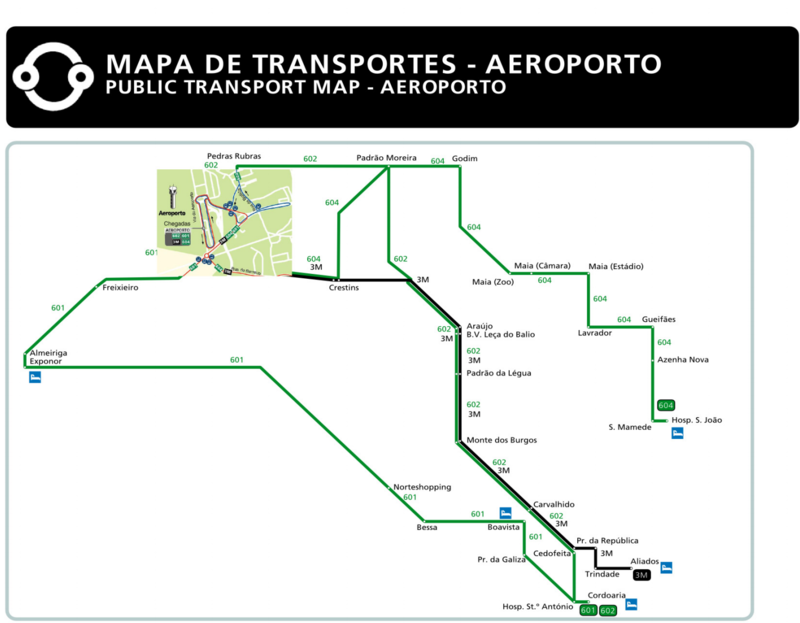 Porto Airport is located around 15.9km away from Sao Bento Station, the journey by taxi should take around 25 minutes. How many transfer options are there from Porto Airport to Sao Bento Station? There are three transfer options to take to Sao Bento; taxi, metro or bus. However, by taxi is the only direct route to the station available.